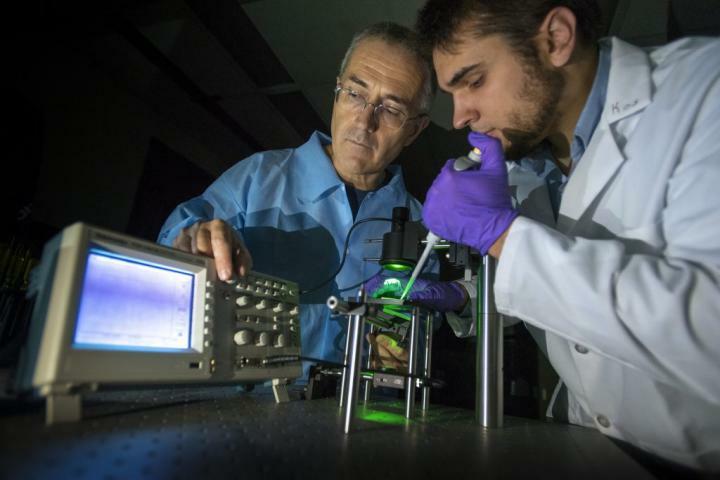 University of Connecticut researchers have developed a device that tests an important indicator of heart health that is often ignored – blood viscosity. Blood can be a window into the health of your heart. Doctors are often on the lookout for some common signs that might point to an issue, like abnormal cholesterol levels or high blood pressure. From heart attacks to strokes, routine blood tests can screen for several types of life-threatening cardiac events. But less attention has been paid to blood viscosity. Viscosity measures a fluid's resistance to flow. Thick or sticky liquids like honey have high viscosity, while thin, watery liquids have low viscosity. In the case of blood, higher viscosity may signal potential problems, since the heart needs to work harder to pump sticky blood. Thick blood also means organs and tissues receive less oxygen and may cause damage to the lining of blood vessels due to increased friction as blood travels throughout the body. Studies have shown that increased blood viscosity was significantly more prevalent in patients who experienced heart attacks and strokes compared to patients with lower blood viscosity. In fact, one study found that increased blood viscosity is a more likely sign of a potential cardiac event than high blood pressure, gender, or smoking. Yet despite this strong correlation, physicians can't currently evaluate blood viscosity at routine office visits. "We were very surprised that there is no commercial option to quickly and simply check this critical piece of information," says UConn Associate Professor of Mechanical Engineering and co-inventor, George Lykotrafitis. "The research shows there is a connection between blood viscosity and cardiac events, and the equipment exists to test it, but not in a practical or efficient way. We decided to try to solve the problem." So Lykotrafitis and doctoral candidate Kostyantyn Partola developed a small electronic device that can measure blood viscosity at the point of care. The pair recently filed a provisional patent on their invention with the help of UConn's Technology Commercialization Services. "Our technology really is plug and play, but the impact is significant," says Partola. "With this information, doctors can suggest simple life-style changes on the spot to prevent their patients from having a stroke or heart attack." Lykotrafitis and Partola's device may be simple, but the science behind it is specialized and tailored to blood analysis. Blood behaves as a non-Newtonian fluid, which means that its viscosity changes depending on its velocity at any given time. Since the velocity of our blood differs when pumping and at rest, its viscosity also changes. This can be a complication for commercial instruments that are currently used to measure viscosity, but not for the device Lykotrafitis and Partola have developed. Here's how it works. A clinician places a droplet of blood onto a small card of transparent plastic containing a microchannel. The blood wicks into the microchannel and flows through a small groove using its own capillary pressure. When the microchannel card is placed on a stage between a light source and a photodiode detector – a device that converts light into an electrical current – the device Lykotrafitis and Partola have developed measures how long it takes the blood to travel through the microchannel. A few minutes after the sample is placed on the microchannel, a digital screen displays a viscosity reading that indicates whether the patient is at elevated risk for cardiac events. Once the test is completed, the used microchannel card is discarded and replaced with a new one. Since the device itself never comes in contact with the biological sample, practitioners don't need to sterilize it in between patients or worry about cross-contamination. Currently, to measure blood viscosity physicians would typically need to send large samples to an off-site lab for analysis in a rheometer, an instrument that measures viscosity mechanically. Commercial rheometers require large samples, take much longer, cost thousands of dollars, and are also commonly used to measure the viscosity of industrial liquids like oil, paint, or personal care products. The commercial equipment needs to be sterilized in between tests because of this multi-purpose capability. Travel time between the medical office where the blood was originally collected and the commercial facility where it is tested also means that samples are no longer reliable. This is all less than ideal for clinical applications. In contrast, the device that Lykotrafitis and Partola are developing only requires a finger prick of blood, gives precise readings in just a few minutes, and will cost under a thousand dollars. Helping scientists to "get out of the lab" and to commercialize the important technologies they develop is a major priority at UConn, according to Radenka Maric, UConn's vice president for research. "There is a wealth of amazing ideas being developed at UConn and UConn Health every day, but to have an impact they need to reach beyond the lab" says Maric. Partola and Lykotrafitis have formed a startup, Eir Medical Devices, based on their research. The pair are in early discussions with physicians at UConn Health and Yale University to conduct clinical trials.